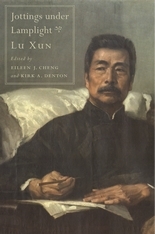 Lu Xun (1881–1936) is widely considered the greatest writer of twentieth-century China. Although primarily known for his two slim volumes of short fiction, he was a prolific and inventive essayist. Jottings under Lamplight showcases Lu Xun’s versatility as a master of prose forms and his brilliance as a cultural critic with translations of sixty-two of his essays, twenty of which are translated here for the first time. While a medical student in Tokyo, Lu Xun viewed a photographic slide that purportedly inspired his literary calling: it showed the decapitation of a Chinese man by a Japanese soldier, as Chinese bystanders watched apathetically. He felt that what his countrymen needed was a cure not for their physical ailments but for their souls. Autobiographical accounts describing this and other formative life experiences are included in Jottings, along with a wide variety of cultural commentaries, from letters, speeches, and memorials to parodies and treatises. Lu Xun was remarkably well versed in Chinese tradition and playfully manipulated its ancient forms. But he also turned away from historical convention, experimenting with new literary techniques and excoriating the “slave mentality” of a population paralyzed by Confucian hierarchies. Tinged at times with notes of despair, yet also with pathos, humor, and an unparalleled caustic wit, Lu Xun’s essays chronicle the tumultuous transformations of his own life and times, providing penetrating insights into Chinese culture and society.